Following weeks of rumor and speculation, it is confirmed that Jeff Brohm has declined an offer to come to the University of Louisville as football head coach. He will remain at Purdue and the search for a new Cardinal coach will continue. Brohm released a statement this evening explaining his decision. The former Cardinal said timing was a big factor in the choice. Tyra remained in contact with Brohm since this past Sunday. The two reportedly met yesterday afternoon to discuss terms for a potential deal. Brohm rejuvenated Purdue’s program and, this season, recorded wins over Ohio State and rival Indiana. To depart such a positive and uplifting situation for a struggling program in Louisville would have been no easy choice. Furthermore, Tyra sat in a sticky situation with shortage of University funds to draw his and the fans’ most popular choice. Similar to his verdict that “dollar signs or not, it was time to make a decision” to fire Bobby Petrino, Tyra persevered to tap Brohm regardless of financials. The native son decided to stay put, so someone else will have to inherit the U of L coaching job less than one week out from the final loss of a dismal 2-10 season. The next coach will not only look for ways to reinstall a heightened Cardinal culture for football, but also recruit talented and ambitious players to rebuild a drowning program. No one is certain who Tyra will tap next, but local media are mentioning him looking to Appalachian head coach Scott Satterfield. Born and raised in the city, here’s a history of Brohm’s athletic career from when he became known as the “Kentucky High School Player of the Decade” in the 1980s. Since attending Trinity as a youth in town, Brohm logged an interesting career in athletics. The Montreal Expos selected him in the seventh round of the 1989 MLB Draft out of high school. Instead, Brohm elected to play baseball and football for U of L.
He played one year of backup quarterback for the Cards while playing summer ball for the Cleveland Indians between seasons. Brohm then dropped the professional diamond for his final two seasons of U of L football. As starting quarterback, the hometown hero led his team to the 1993 Liberty Bowl. After graduation, Brohm competed in the NFL for six different teams (Chargers, Redskins, 49ers, Buccaneers, Broncos and Browns) between 1994-2000. He also played one season with the Orlando Rage in the XFL. In 2002, Brohm started his coaching career at the Louisville Fire in the Arena Football developmental league. The former student athlete revisited U of L in 2003 and became quarterbacks coach under Petrino for five years. The pair, along with Brohm’s acclaimed brother Brian at quarterback, won the 2007 Orange Bowl following a record-breaking 12-1 record. Petrino left for the NFL and the Atlanta Falcons while Brohm remained on staff for two seasons under Kragthorpe, declining an offer to join Nick Saban’s crew at Alabama. From 2009-12, Brohm coached on the staffs of Florida Atlantic, Illinois and UAB. He acquired his first head coaching job at Western Kentucky and stayed there from 2014-16. 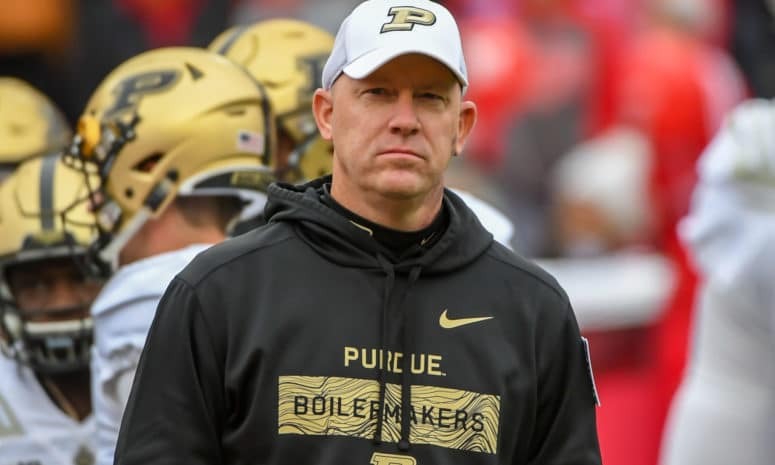 Brohm began his stint as Purdue head coach in 2017 and won his first postseason victory for the Boilermakers at the Foster Farms Bowl. His current team will find out their bowl selection on Sunday, Dec. 2. Brohm is 43-22 overall as a head coach.